First and foremost, in everything that we do, our goal is to connect you with the right insurance policies and insurance companies. Though we don’t directly provide insurance in and of itself, we are the trusted insurance brokers in Ottawa who you can rely on to help you find the right fit with the multitude of insurance companies that we work with. 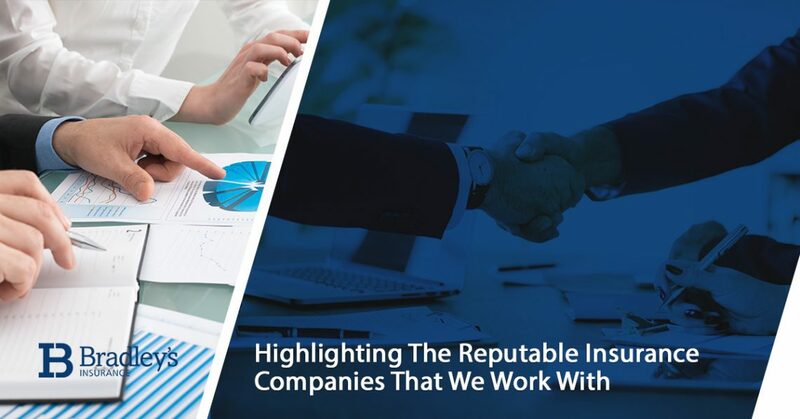 Only confiding in the most trusted and reputable insurance providers on the market, Bradley’s Insurance is proud of our partnerships with the companies we represent. From our roots in commercial insurance to our progressive expansion into the personal insurance market, our Ottawa house insurance experts are confident that you’ll be happy working with the company that we reach out to on your behalf. In fact, we’re so excited about the companies we’ve partnered with that we’re dedicating today’s blog post to learning a little bit more about the whereabouts, background, and company values of each of these experienced insurance providers in Ontario and beyond. No matter your situation in terms of home insurance, your auto insurance policy or any other need to financially protect yourself, our network of insurance providers are here to take good care of you. We wouldn’t have it any other way! Continue reading below to learn more about working with our team of insurance providers, or feel free to contact Bradley’s Insurance at any time with any questions about how we can serve you. We’re looking forward to helping you! No stranger to the insurance market, Aviva serves some 33 million customers around the world to help them “defy uncertainty” in their lives. Simply put, Aviva is here to help people when bad things happen to them — a simple but accurate approach to insurance coverage. Aviva is regarded as a “composite” insurer, meaning that they provide their customers with a wide range of products and services from auto insurance, home insurance, health insurance, pensions, investment guidance, asset management, and more. Every year, Aviva pays their customers over £34.6 billion in claims and benefits. Though we don’t directly insure our customers directly through Bradley’s Insurance, we did partner with founder Jeff Smith to create Smith & Bradley’s Insurance. Founded in 2011, this company leverages some of Ottawa’s most experienced industry leaders to provide insurance solutions for a variety of industries and personal affairs. From alternative energy to warehousing, golf courses and even bonding and surety, Smith & Bradley’s Insurance prides themselves on their ability to customize their policies to meet even the most specific needs of businesses and individuals. Heartland Farm Mutual specializes in agribusiness and rural protection, helping mitigate the risk that natural disasters like fires, flooding, and hail storms present to farmers across Ontario. While insuring farming businesses is their bread and butter, Heartland Farm Mutual also offers services like car insurance, commercial insurance, farm insurance, home insurance, and specialty coverage. Our country’s farmers put food on the table for the people, and Bradley’s Insurance values this important service. That’s why we partner with the best farmers insurance providers. As another specialized insurance provider that we work with, Ecclesiastical has regional offices located in Dartmouth, Toronto, Calgary, and Vancouver, but also provide their services to Ontario residents. Ecclesiastical’s main goal is to help protect and preserve the distinct communities, culture, and heritage of our great country in an honest and transparent manner. With roots dating back to 1955, Unica Insurance is a subsidiary of property and casualty insurer specialists La Capitale General Insurance of Canada. A proud member of Dependably Canadian®, Unica believes that your hard-earned assets deserve the best protection and fair payout should the unexpected occur. Sharing the same values of integrity and a customer-centric mindset as we do, Bradley’s Insurance is proud to partner with Unica. A leading name in Canadian general insurance, RSA Canada is a trusted provider of a broad range of insurance services including home, auto, business, marine, and travel products. With roots dating back to 1833 thanks to Royal Insurance, it’s no wonder that RSA is such a trusted and reputable insurance provider in Canada. These mutual insurance experts enjoy deep roots in the history of Canadian insurance like several of the providers that Bradley’s Insurance works with. Imagine founding an insurance company in a time where fires were the biggest threat to your home or business, but there was no fire department to put them out! Naturally, Gore Mutual Insurance Company has come a long way since the 1800s, developing innovative insurance technologies like BrokerLift and uBiz to benefit their customers. Acknowledging that the insurance claims process is often lengthy, complex, and downright unnecessarily drawn out at times, Chubb seeks to simplify the process through a people-centric approach. Their seasoned claims specialists aim to find solutions that don’t just work, but work in an expedient manner that doesn’t leave their customers wondering what’s going on. The Travelers network of industry professionals spans over 11,000 people, helping provide responsive feedback to customers who can file a claim anytime, anywhere. Taking a proactive approach to insurance and loss mitigation, Travelers features a dedicated Catastrophe and Large Event Management team that monitors severe weather patterns to help provide rapid response times to affected customers. Whether you’re in search of personal or business insurance services that you can trust, Intact Insurance is an excellent provider of Canadian insurance. Intact is an avid supporter of C.A.N.A.T.I.C.S., or the Canadian National Insurance Crime Services organization. This means that they are supporting the fight against insurance-related crime, including cybersecurity threats, on a daily basis. Experts in claims management, the Frank Cowan Company maintains a small but powerful in-house claims department. This helps ensure a thorough and speedy turnaround time when customers file just about any type of specialized or non-specialized claim. As a Managing General Agent (MGA), this provider has the authority to write and service businesses in order to protect these specialized companies in a dynamic market. Though Zurich’s roots come from Switzerland (to no surprise), they expanded to North America in 1912 in hopes of benefitting other countries with their dedicated insurance services. Sure enough, Zurich found success and now helps businesses in 25 industries and in more than 210 countries and territories. They’ve even helped insure a number of massive projects including the Hoover Dam and Madison Square Garden. This Canadian insurance provider is excellent at not only protecting well-established businesses, but also fledgling small businesses. They also provide seasoned personal insurance services in the way of Ottawa home insurance and auto insurance. With a vested interest in your company’s unique business insurance needs, they’re a great choice for trusted commercial insurance services. 125 years of experience positions Grenville Mutual Insurance as a reputable, community-driven insurance provider specializing in claims management, loss prevention, and flexible payment options. Helping guide your life decisions in a way that benefits you and not their insurance professionals, Grenville Mutual Insurance is yet another trusted provider that Bradley’s Insurance works with. Let Our Ottawa Insurance Brokers Connect You With The Right Insurance Provider! Prior to this paragraph, you may not have been familiar with the providers that we work with — and that’s perfectly fine! At Bradley’s Insurance, it’s our job (and not your job!) to find an insurance provider that you’re comfortable working with, and one that understands your needs and unique life situation. Are you ready to switch insurance providers or simply obtain a policy that you don’t currently possess? Get started with a free quote from us or contact Bradley’s Insurance today to learn more about Ottawa home insurance services and more.